This week I received a call from a potential client wanting hippotherapy. They had picked up my flyer and hoped I could help. There are big differences between hippotherapy and what I do, therapeutic riding, so today I am going to explain some of the major differences. The American Hippotherapy Association, Inc., defines hippotherapy as a “physical, occupational or speech therapy treatment strategy that utilizes equine movement”. 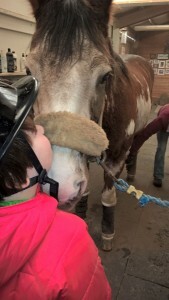 PATH International, defines therapeutic riding as “an equine-assisted activity for the purpose of contributing positively to the cognitive, physical, emotional and social well-being of individuals with special needs.” This is the organization I am certified with. There are two main differences that stand out to me. The first being that in hippotherapy a patient works with a therapist, whether physical, occupational or speech. The second being that hippotherapy focuses on the use of the horses movements to treat a physical disability, it is not a riding lesson. On the other hand, therapeutic riding does not require a therapist and is a recreational activity to positively impact a person with special needs. 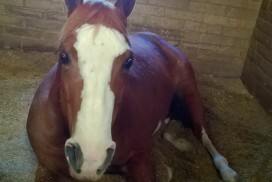 There are two focuses in Therapeutic riding, physical health and mental health. 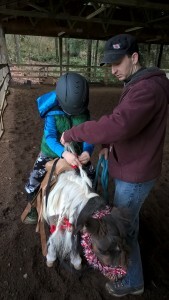 Depending on how the instructor tailors lessons and goals, therapeutic riding can greatly impact a rider physically or mentally. For example, when working with a child who has a physical diagnosis that effects balance I will plan lessons that are going to include stretches, core strengthening and cross body movement. An example is asking the rider to use their right hand to pick up an object on their left side or vice versa. When working with a child with a mental diagnosis that perhaps effects things like emotional awareness or anxiety I can use the horse to encourage sharing, boost confidence and promote empathy. I’ve witnessed kids who are scolded by their parents while waiting before a lesson for hitting a sibling or parent but when working with the horse a simple ‘he doesn’t like when you hit him’ has stopped them in their tracks. I’ve worked with a rider who was so nervous and shy she could not assist in tacking up the horse but eagerly climbed on and rode with a smile on her face. I’ve had siblings who constantly fought at home and would not share snacks before lessons patiently wait while the other took turns completing an obstacle course or trotting. In just a few lessons these riders have shown progress at the barn and eventually at home, or even school. With Empowering Strides I focus on the mental health side of things. I certainly have riders that face physical challenges, but I’ve really grown to love and appreciate what the horse can do for our mental health.